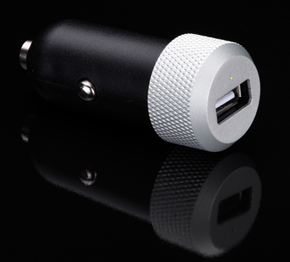 Just Mobile Highway is a car charger for iPhone, iPad and other USB-powered devices. The Highway plugs into the cigarette lighter, delivering 2.1A output to rapidly charge your mobile devices and a fuse to protect from power surges. Just Mobile designed the Highway as an aesthetically pleasing car accessory for power hungry mobile devices. The diamond-thread headed device, which is available with an aluminum or all black head, uses the cigarette lighter socket and has a single USB port. There is a micro-LED power light to indicate charging status. The Highway is marketed as a fast charger, providing 2.1A output required to charge power demanding devices like the iPad. The included Apple certified coiled charging cable can be detached and used to connect other USB devices. Just Mobile Highway has a 1 year warranty for defects. The ability to charge the iPad is the Highway’s best feature. Charging times were comparable to charging via the outlet in your home or office. My 45 minute commute was sufficient to charge my iPad from a nearly drained battery. The size of the charger, 2.5 x 2.5 x 5.9 cm, ensures it will fit in the limited space provided for most car cigarette lighters. What are the negatives for Just Mobile Highway? The price may be the biggest deterrent for most consumers. Beautiful design is generally not the first feature considered for a car charger. Being able to rapid charge mobile devices and to charge the iPad may not be great enough to overcome the price. I like the Just Mobile Highway because it complements the beautiful design of the iOS devices. Since I already have a USB and auxiliary cable to charge and integrate my iPhone to my car stereo and hands-free system, the Highway can be used to charge my iPad or the mobile devices of the passengers. Yes, this can be done with a cheaper charger, but not with the style of the Just Mobile Highway.